Governor of Imo State, Owelle Rochas Okorocha has demanded for a comprehensive list of Imo sons and daughters serving various jail terms in the US prisons with the offences for which they were accused of and convicted. 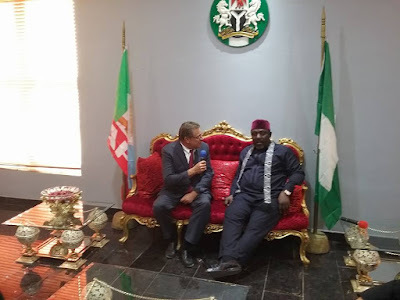 Okorocha made the demand yesterday when the United States Consulate General in Lagos, Mr. John Bray, paid courtesy call on him at the Government House Owerri, stating that the state has her sons and daughters in the US prisons, with some of them guilty as charged, while some of them were victims of social circumstances. According to him, the great partnership between Nigeria and the U.S. has been of immense help to the state and most of the Imo sons and daughters have got themselves equipped technologically as a result of being trained in the USA. “We need assistance in the area of communication especially upgrading the internet facility in the state. This will help in connecting the state to the rest of the world”.